The U.S.-backed Syrian Democratic Forces (SDF) has not received a request from any foreign government to hand over two British Islamic State militants in its custody but will study any such request if made, a senior SDF official told Reuters on Friday. “We have not received any official request from any international party to hand over the two prisoners,” Redur Xelil, the SDF official, said. Any such request would be studied, he added. 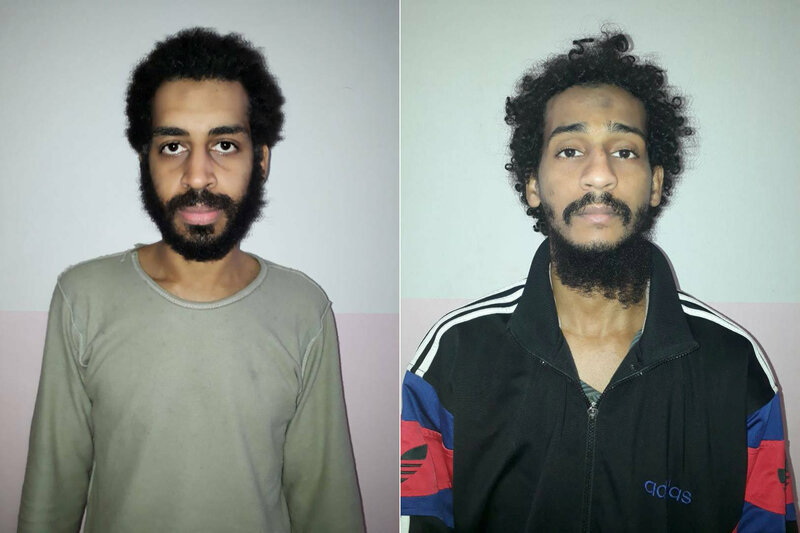 U.S. officials said on Thursday that the SDF, a militia force, had last month captured Alexanda Kotey and El Shafee ElSheikh, two of four militants known as the “Beatles” for their English accents. They were notorious for their role in the kidnap, torture and killing of Western hostages in Syria. Earlier U.S. and European officials said on Friday that Britain, the United States and officials in the region are discussing what should happen with the two militants. “Together with our coalition partners, we are still considering options regarding ElSheikh and Kotey, but rest assured there is a common intention to hold anyone accountable who commits acts like those they are alleged to have committed,” said a spokesman for the U.S. National Security Council. British government officials declined to comment. Xelil also confirmed that officials from the U.S.-led coalition against Islamic State had taken part in the questioning of the two Britons. Earlier Xelil told Reuters Kotey was captured in a rural area of Raqqa province on Jan. 24 and was aiming to reach Turkey when he was captured by the Kurdish-led forces. “He was intending to escape towards Turkey with cooperation and coordination with friends of his on the Turkish side,” Xelil said. “He is now under investigation with us,” he said. Xelil gave no information about the second militant, ElSheikh. A senior security official in Turkey, however, accused the SDF of anti-Turkish propaganda, saying it was “nonsense” that an Islamic State militant would say they were going to Turkey, and that Ankara was taking every step to eliminate IS militants in Turkey. “It is not that easy to cross the border without permission. There is a wall as well,” said the official. The SDF, which is spearheaded by the Kurdish YPG militia, has consistently accused Turkey of supporting Islamic State militants in northern Syria, where the U.S.-led coalition has helped the SDF to drive the jihadists from swathes of territory. In 2016 Turkey launched a military incursion into northern Syria to drive back IS fighters from the border, and it has built a wall along its 911-km (566-mile) frontier to try to halt infiltration. Turkish authorities have also detained hundreds of people across Turkey suspected of being Islamic State members since IS fighters were defeated in the Syrian city of Raqqa in October by the SDF. Turkey views the YPG as an extension of the Kurdistan Workers’ Party (PKK), which has fought a three-decade insurgency in Turkey and is listed as a terrorist group by the United States and the European Union. It launched an offensive into the Kurdish Afrin region of northwestern Syria on Jan. 20, aiming to crush the YPG. The New York Times reported on Thursday that the British government had revoked the British citizenship of both Kotey and ElSheikh. Britain has taken similar action in the past against dual nationals who left Britain to join militant groups abroad. In the case of a former London resident who joined the Somali militant group al Shabaab, the militant Mahdi Hashi was sent for a federal court trial on terrorism related charges in New York. Hashi pleaded guilty to charges of conspiring to provide material support to al Shabaab and was sentenced to nine years in U.S. prison.